Necessity, “the mother of invention,” spurred Peres to launch Quix Products. The Quix Bottle™ (which is a play on the words “quick” and “mix”) contains a unique patent mixing system that consists of an upper and lower container separated by a valve. One container holds water and the other holds powered baby formula. The user pre-pours the water into the top portion of the bottle, and dry baby formula into the lower container. When it comes time to feed the child, opening the valve combines the two very quickly with a simple twist and shake, making it convenient anytime, anywhere. 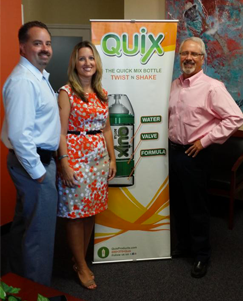 For me, the best part about developing the Quix Bottle is when I get to help create a product that people truly benefit from, and see it in use. The joy is seeing something from an idea to the finished product in someone’s hand. The thrill is witnessing the smile on their face and the enduring delight that comes with a well-designed product. A well thought out design can literally change a life; it’s a feeling like no other. Be sure to check back to our site as we add new products to the Quix family, or join our mailing list to be notified of news and special offers as they happen.